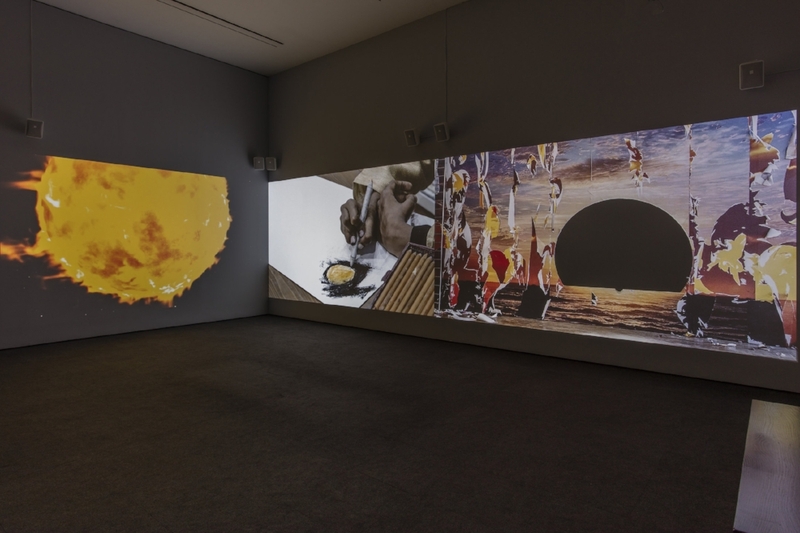 CHoksi Transformed the live footage from Every Kind of Sun into the film Everything Sunbright, (i) in the womb (ii) lives, (iii) ever rehearsing the end *indirectly (2018), which debuted at the Hammer Museum as part of the exhibition, Made in L.A.
Neha Choksi, Everything sunbright, (i) in the womb, (ii) lives, (iii) ever rehearsing the end *indirectly (2018). Four channel video installation with i, ii, iii as projections, * on monitor, 26 minutes 12 seconds, synched loop. Courtesy of the artist and Project 88. Taking footage from her Dhaka Art Summit 2018 commissioned live work, Every Kind of Sun (2018), Neha Choksi developed the new film, Everything Sunbright (2018), that debuted at the 2018 edition of the Hammer’s acclaimed biennial exhibition, Made in L.A. 2018. Neha Choksi’s obsession with the sun is related to her long-standing interests in absence, loss, memory and nature. Every Kind of Sun (2017-2018) debuted as a Solo Project during the Dhaka Art Summit 2018 and was commissioned and produced by Samdani Art Foundation.